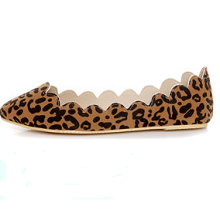 Feed your appetite for adorable footwear with the irresistible Leopard Print Scalloped & Pointed Flats! Velvety vegan suede upper in stylish leopard spots is sweetly scalloped and top-stitched around the opening, with a slightly pointed toe that’s timelessly chic. Slightly padded insole. Non-skid, rubber flex sole. Fit runs a bit wide and slightly short. Measurements are for a size 6.